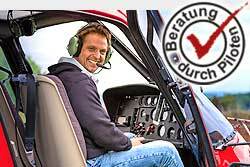 Individual flights of any kind at any time from the Heliport Neumarkt Dippenricht. Start with the Agusta 109 "power" with luxurious VIP amenities and enjoy an unforgettable helicopter ride for 1-7 people. We are happy to pick you up from anywhere, no matter where. Or simply download times your customers or business partners to a helicopter ride a - this meeting will never forget!